A recent conversation with a travelling companion of Jewish faith reminded me yet again that Jesus Christ was, like my companion, a man of Jewish faith. Jesus was born of a woman who was Jewish, raised in a Jewish household, carpenter’s shop and community. His ministry was in the context of the people of Israel, who with their religious texts and traditions were firmly established in the lands of their ancestors, their lands promised by God. Jesus made the extraordinary claim that he was the Messiah, the Christ, of whom the texts of the Jewish people testify! In a post resurrection appearance Jesus reminds his disciples that “Everything must be fulfilled that is written about me in the Law of Moses, the Prophets and the Psalms” (Luke 24:44). Our discipleship is enriched through a growing appreciation of the relevance of the Old Testament to Jesus’ personal claims and ministry. 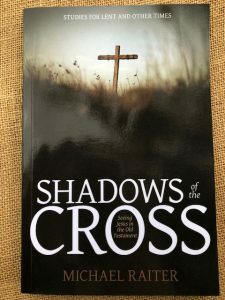 Shadows of the Cross: seeing Jesus in the Old Testament gives such enrichment by opening up 40 Old Testament passages, one for each day of Lent, in easy-to-read two page daily reflections each concluding with a prayer. Four sections comprising The Law, The History, The Wisdom and The Prophets, each of ten reflections, structure the studies. Eight sets of five questions for group discussion or personal reflection take us deeper. A mix of well-crafted general and personal questions facilitates a range of engagements with the Old Testament texts and their relevance to Jesus’ ministry. Anecdotes commonly commence each reflection and give easy access to the theme. Thus the first reflection, ‘The Cross in the Garden’, begins with the story of the five hundred Australians who set out for Paraguay in 1893 on an ill-fated project to build a communist utopia. The study asks, “Why do our highest ideals invariably disappoint us?” and leads into “the fall of humanity” in Genesis 3 and then to consider the pastoral epistle’s warning, “Dear children, do not let anyone lead you astray” (1 John 3:7). Reflection through story, Old Testament text, New Testament text: all leading to our life before God in prayer. The author, Mike Raiter, puts to good effect his skills gained in teaching history and English to elaborate the context of the biblical texts. Thus in developing the Day 11 study, “There has never been a day like this” – the sun standing still for the victory of Joshua and Israel as they did battle to occupy the land promised by God – the author’s storytelling reminds us of epoch-changing days: the Magna Carta, Wittenberg Door, first walk on the moon, the Twin Towers and a day when Rome ruled Palestine and the sun stopped shining at midday, and Jesus Christ died (only to rise again!). Lament is a pervasive theme of the Lenten season. In considering Psalms 42 and 43, the author notes, “One of the great weaknesses of contemporary Christian songs is there are so few laments. We need songs of lament”. The image of the deer separated from the herd and panting for life-giving water is evocative of the psalmist’s lament which is then related to Jesus’ sense of abandonment in Gethsemane, “My soul is overwhelmed to the point of death” (Matthew 26:38). The study asks, “Can’t you hear Psalm 42 there?’ “Why, my soul, are you downcast… my tears have been my food day and night” (42:3,5). In prayer, we thank God for a Saviour who has known suffering and abandonment. “Scales of Justice” (Day 36) brings a salutary warning from the prophet Amos against injustice and about the coming day of the Lord. “Little acts of dishonesty” are illustrated from the milkman diluting our author’s milk and from supermarkets which “falsely advertise bread, which was baked months before overseas, as ‘freshly baked today’”. The author doesn’t mince words in noting that Amos points to the final Day of the Lord when “Revelation portrays the merchants of the world weeping” because, “In one hour such great wealth has been brought to ruin (Revelation 18:17)”. Moreover, the prophet Amos speaks of a day when “(the Lord) will make the sun go down at noon and darken the earth in broad daylight” (Amos 8:9). The Old Testament points to the cross of Jesus where darkness covered the land for three hours (Luke 23:44) – truly a “day of the Lord”. I looked forward to each day’s reading and reflection, and I have no doubt that you too will look forward to these daily nutritional Lenten studies.